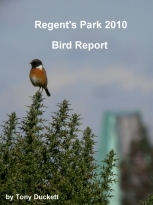 Bird sightings in London's Regent's Park, Bushy Park and Richmond Park. A listing of birds seen, for birdwatchers. The first 8 day's of the month have carried on where October left off. Meaning that it has been very quiet indeed with no really large diurnal bird movements witnessed. There have been a couple of days where Wood Pigeon numbers were creeping up towards a 1000 birds, winter thrush numbers have been low. Redwing when seen are in 1's and 2's with the odd flock of 20 or so birds, Fieldfares are much the same. There have been 3 Skylarks, 1 Bullfinch, 1 Hawfinch, and the occasional small party of Siskins. Mallard numbers are increasing, last month it was hard to find any on the lake. Below is a pictorial from the month so far. This is the best time of the day to witness diurnal bird movements. The October hatched Great crested Grebe chick is progressing well. One of the Skylarks wanted to land in the park being constantly flushed by dogs and the public. It remained over the park for 20 minutes before heading off to the east. Water Rail: there are at least 3 birds in and around the reed beds in areas 1 and 2. This Cetti's Warbler was present on the 6th and 7th and was only the 2nd bird that I have seen in the park. There was a report of one a few winters ago but it wasn't present the next day. © 2013 Tony Duckett. Simple theme. Powered by Blogger.